Published: Aug. 5, 2015 at 05:25 p.m. Updated: Aug. 5, 2015 at 05:33 p.m.
Preseason football kicks off on August 9 when the Pittsburgh Steelers and Minnesota Vikings go toe-to-toe in the annual Hall of Fame Game. While it’s great to have real football back, the preseason is also an important time in fantasy football. We get our first glimpse of how players are looking, who is getting first-team reps, and who is performing better than expected. With that in mind, here are the top 25 players we’re watching this summer. 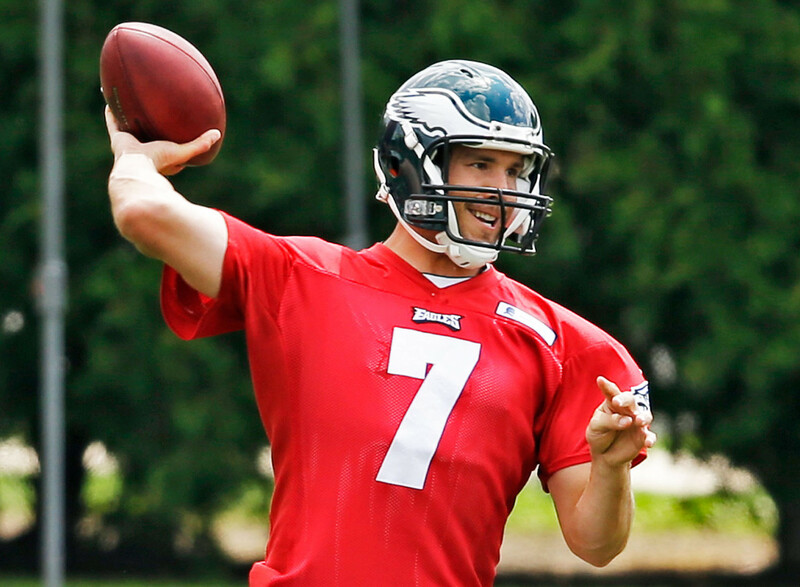 The last two seasons have taught us that Chip Kelly can near "quarterback proof" his offense. No matter who has been behind center for the Eagles, they've been a usable fantasy asset. In 2013, Nick Foles put up 27 touchdowns to just two interceptions. Last season, the Foles/Mark Sanchez combination would have finished as the 14th best fantasy quarterback. Sam Bradford's career hasn't gotten off to a stellar start, but he's a more physically gifted player than either of his predecessors. Health is the biggest obstacle's that's plagued Bradford to this point. Seeing how he appears physically in the preseason will be of the upmost importance for fantasy owners. If it's smooth sailing for Bradford's health, he's the most obvious quarterback sleeper for 2015. Joique Bell is still struggling to find his way on to the practice field as he recovers from offseason surgery. Meanwhile, rookie runner Ameer Abdullah earned rave reviews in OTAs from just about everyone who witnessed the team. When exhibition games kick off, even if Bell is still the assumed starter, all eyes will once again be on Abdullah. Despite a smaller frame, the Lions' second-round pick was a powerful and aggressive runner in college. We'll be looking to see whether he can continue deploying that style in the NFL, when the competition is bigger and stronger. How Abdullah is used will also be of interest. The Lions could employ an "all hands" approach to the running back position, with Bell being the goal-line back and Theo Riddick being a passing game specialist. Abdullah can do a little of both, but fantasy owners would obviously prefer he inherits the majority of one role, while only slightly splitting work with one other back. People seem to forget that DeMarco Murray was an excellent running back before the Dallas offensive line reached legendary status in 2014. He averaged 4.9 yards per carry prior to last season, and was the seventh-highest scoring RB in 2013 (despite only playing in 14 games). Everyone wrote the narrative that Murray would be ineffective outside of the Cowboys' offense before he even signed with Philadelphia. Fantasy owners will be keeping their eyes peeled in the preseason to see if there was any truth to that idea. Just as important, pay attention to how explosive he looks. After handling 449 touches last season, there is a legitimate concern Murray lost serious tread from his tires. A few big runs in the preseason would ease those concerns, and reassert him squarely in the first round conversation. Genopologists are excited that the Jets' addition of offensive coordinator Chan Gailey may finally bring an opportunity for Smith's career to take off. The longtime NFL coach is well-regarded for his ability to turn a less talented offense into a functioning unit. With Gailey set to install a spread offense, Smith will feel miles away from the rigid, run-based offenses he played in under Rex Ryan. It will certainly help that he'll play this season with the best weapons ever assembled for him at the NFL level. How comfortable and adjusted Geno Smith looks in his new situation will be important to observe in the preseason. And if he has one of his patented exhibition disasters, this sleeper train could be off the rails before it even gets going. One of the more popular breakout players in the fantasy community, the Allen Robinson hype train is a near universal one for analysts to board. With all the excitement surrounding Robinson, preseason will be a big time for those in his fan club. Even his most staunch defenders will admit there is something of a leap of faith after he only played 10 games as a rookie. Robinson is set to absorb at least 130 targets this season, but fantasy owners must pay careful attention to how Robinson looks and the status of the quarterback delivering those passes. How Blake Bortles plays will speak to what kind of ceiling Robinson will have, even if his floor is still safe. When the Rams elected to not have Todd Gurley start training camp on the physically unable to perform (PUP) list, we were forced to re-evaluate his fantasy draft stock. With Gurley now set to, hopefully, play a full season in his rookie year, how he looks in the preseason will be of the upmost importance. The Rams are reportedly still planning on having Tre Mason start the season off as the lead back. However, if Gurley comes out and tears through the preseason, there will be a "can't put the genie back in the bottle" effect. That is just how it goes for players you invest the 10th-overall pick in. Ben Roethlisberger created waves when he called Markus Wheaton the Steelers "breakout player" for the 2015 season. Prior to that, the masses believed Martavis Bryant was destined for stardom as soon as this year. While training camp confidence boosts are never the type of material you want dictating your draft decisions, Roethlisberger's declaration leaves fantasy owners with preseason scavenging to do. Wheaton has struggled to get on the same page with his quarterback throughout his NFL career, and played poorly last year. If those problems look to be alleviated, Wheaton may put up a career best season. On the other hand, a few big plays from Bryant in the preseason could end those plans quickly. All eyes turned to Joseph Randle when the Cowboys passed on selecting a running back in the 2015 NFL Draft. With Darren McFadden the only notable veteran in the backfield, Randle became the player the team stood behind. With Randle set up as the odds on favorite to earn the starting job in Dallas, how he performs in preseason is a big story to watch. Playing behind a star-studded offensive line in Dallas gets Randle some attention. Should he go out and blow the doors off with a big preseason performance, his ADP is sure to rise accordingly. With Le'Veon Bell set to serve an early season suspension, his primary backup, DeAngelo Williams, will be a popular late-round target for those who take the Steeler starter. The former Carolina Panther will tote the rock for Pittsburgh while their star sits out, but he looked his age last season. So while he's going to get some good opportunities in the first two weeks, we are not sure just how much he can do with them. It will be important to see how much juice he has left in his legs. If he looks finished, as he did at times in Carolina last year, then he may not even be worth a pick for the two week fill-in. Should he look re-invigorated by a new team, then Bell owners will be rushing to grab him as a strong handcuff. Reports out of Pittsburgh camp are positive. Now let's see it in action. The Bishop Sankey experience never took off last season, as he put up middling production throughout his chances to start. The rookie runner averaged 3.7 yards per carry and only took 11 of his 152 carries for 10 or more yards. His woeful first season has opened up the door for a potential challenge from David Cobb, a rookie out of Minnesota. While Cobb was drafted in the fifth round, he could bring a steady toughness, which Sankey does not, to the running game. Reports out of Tennessee indicate this is likely to be a running back by committee approach, but a strong preseason showing from either Cobb or Sankey would go a long way in tilting the scale. The Browns training camp opened with Terrance West, Isaiah Crowell and Duke Johnson all taking reps with the first team. Then bad news came when West and Johnson both found themselves on the injury report. Nothing is going to come easy with Cleveland running backs this season. As it stands today, all three could realistically be the top scoring player for the Browns in any given week. Fantasy owners are right to be skeptical of investing much into this backfield right now. However, preseason could give us a clue as to how the team plans to employ the trio. If Johnson is targeted frequently, he could be a nice buy for PPR leaguers. Same for players craving for a bargain workhorse if Crowell performs head and shoulders above everyone as the early down banger. How the Patriots divvy up the quarterback reps during the preseason will be interesting enough. Watching how Jimmy Garoppolo plays will provide even more interest for fantasy owners. The drop-off from Tom Brady to the second-year quarterback will be drastic from a "real life" NFL perspective. However, we'll be concerned with how he distributes the football, and who catches his fancy. Rob Gronkowski and Julian Edelman are sure to get theirs in this offense, no matter what. But watch to see if Garoppolo likes to target Brandon LaFell, or whether he has a running back check down artist he looks for. The former first rounder is universally loved as a later tight end target in fantasy this year. Tyler Eifert is an extremely talented player, but has been unable to showcase that ability due to injury. Practicing at 100 percent and with Jermain Gresham out of his way, Eifert could emerge as the No. 2 passing target in Cincinnati behind A.J. Green. Fantasy owners will first look to see if he can make it through the preseason unscathed. If he does, and provides a few nice plays along the way, we'll be knocking each other over to get to Eifert first come draft time. In order to be an upgrade on even the uninspiring Josh McCown/Mike Glennon duo from 2014, Jameis Winston will need to have an historic rookie season. He's certainly talented and football smart enough to do so. Yet, it is important to recognize the odds he is fighting against when projecting the Buccaneers offense. Fantasy owners will be looking at preseason evidence to see how Winston facilitates this aerial attack. We'd like to see him come out and have a good chemistry with Mike Evans, as the two begin what should be a long, and mutually beneficial connection. One of the Vikings' wide receivers is going to have a nice season with Teddy Bridgewater at the helm of Norv Turner's offense. Charles Johnson has the rapport with Bridgewater going back to last season, and is a favorite of the coaching staff. Mike Wallace has a longer pedigree and enticing speed. Fantasy owners will be watching during the preseason to see which receiver the offense looks to funnel the passing game through. Johnson could build on his 2014 momentum, but the scales will tip just as drastically if Teddy connects with Wallace on some deep bombs. Do not rush to put any dirt on the grave of utility all-star, Danny Woodhead. The Chargers are said to be thrilled that the diminutive running back is set to return from missing a sizable chunk of last season with an injury. All signs point to him owning the passing downs in San Diego. Preseason will help determine just how much Woodhead gets sprinkled into the game plan. His utilization is going to cap the ceiling of rookie runner, Melvin Gordon. If he looks his normal self in preseason, he's back to being a regular flex in PPR leagues, and Gordon suddenly looks overvalued. Outside of Amari Cooper, no rookie wide receiver has a better opportunity laid before him to seize early fantasy success than Breshad Perriman. Offensive coordinator Marc Trestman helps his receivers succeed, Joe Flacco has an enticing deep ball, and the depth chart is barren behind Steve Smith. The path is there for him to burst onto the scene, but it will be up to Perriman to capitalize on it. The word out of camp is that he's struggled in spurts with drops and consistency, both issues from college, in addition to working through injuries. While this is far from the drum beat you want to hear coming out of the early returns on Perriman, a strong preseason could be what seals the deal on him earning a starting spot. The Saints seemed pretty pleased to part with Jimmy Graham, and now he's headed to one of the most run-leaning teams in the NFL. Many analysts will rush to remind you no Seattle player has ever seen over 100 targets in the Russell Wilson era. At the same time, the team has never had a passing weapon even close to the caliber of Graham. The use of Graham in exhibition games will be the first step in gleaning just how the Seahawks plan to deploy their new addition. You are looking for him to have a few nice splash plays with Wilson, particularly when the quarterback is on the move. With Antonio Gates on the shelf with an early season suspension, Ladarius Green is finally in the spotlight fantasy analysts have been dying to shine on him. The big, fast and freakish tight end is the type of player that is hard to miss. He is one of a handful of tight ends that can take a short pass all the way to the end zone, and he's playing in an offense that could maximize that ability. Fantasy owners will be desperately watching to see if Green is ready to take a big step forward. Just one or two highlight catches in exhibition, and this cat is not going back in the bag. The recent serious injury to Arian Foster creates a major shift in the Houston Texans offense. Someone could emerge out of a committee including Alfred Blue, Jonathan Grimes, Chris Polk and potentially a free agent. While performance and stats will be worth checking out, fantasy owners will need to carefully monitor playing time in this situation. Who takes the first few snaps? Who is deployed on passing downs and near the goal line? We'll be tracking these moments, and trying to glean who the coaching staff trusts and favors. That is, of course, provided one of these players doesn't suddenly blow the doors off with their opportunity. There is a section of the football community that believes Andre Johnson is finished. His yards per target figure scares them away from the veteran receiver. While Johnson is certainly not the player he was just a few years ago, he was held back by a poor quarterback fit last season, and is still capable of producing at the NFL level. Now, it just so happens he's with one of the league's best quarterbacks, and is surely reinvigorated after his departure from Houston. Fantasy owners will want to see if Johnson is looking spry during the preseason, and in tune with Andrew Luck. Also be sure to track the target disparity between him and T.Y. Hilton. It could be closer than many expect when the games count. Despite some solid production in a few games, an injury gave Sammy Watkins a rough go of things during his rookie season. A hip ailment severely limited his chances to develop as a professional route runner, and he struggled to create separation with that portion of his body compromised. Regardless of his health, Watkins' price in fantasy drafts is still pretty aggressive given his quarterback and offensive situation. However, those who want to take the plunge on the second-year receiver as a WR2 would like to see him running at the full speed he displayed in college. Early videos out of camp indicate that fantasy fans should be excited to see a much more fluid Watkins in the preseason. The splits for the Arizona receiving corps between when Carson Palmer played, and when he did not were rather drastic a season ago. When the veteran quarterback mastered Bruce Arians' offense last season, the unit was humming and players' respective talents were shining through. Unfortunately, Palmer re-tore his ACL, and spent this offseason rehabbing that injury. Palmer is apparently completely ready to go. Yet, given his advanced age, fantasy owners would feel much more at ease if Palmer went out and put together some strong exhibition outings. All three Arizona receivers (Larry Fitzgerald, Michael Floyd, John Brown) are fantasy targets, and in order for them to reach their statistical ceilings it is vital that Palmer plays. Not many knew that Brian Quick's shoulder injury last season nearly cost him his playing career. Luckily, he's good to go now, and is expected to play in the preseason. Quick's injury caused the masses to forget he was producing WR2 and WR3 numbers before his injury. He put up 322 yards and scored three times in the first four weeks of the season. The Appalachian St. product was just starting to put things together when he went down. Now, Quick is completely off the radar in redraft leagues. Nick Foles, for all his flaws, is likely to provide a quarterback upgrade for the Rams, and Quick could be his No. 1 receiver. Fantasy owners should watch to see if he's still progressing, despite the injury, because they may have a steal waiting for them. Well, for one, who would not want to watch Travis Kelce play football at any chance they can get? The Chiefs emerging tight end is one of the premiere size/athleticism physical specimens in the NFL today. He made dazzling plays with the ball in his hands last season, and he was still recovering from microfracture surgery on his knee while splitting time with veterans. Now, Kelce is set to inherit the full tight end workload, and could become the target hog of the Chiefs' offense. Kelce had an impressive preseason last year, but this time around fantasy owners will be looking for the big plays to take place against starters. With his ADP now in the fifth or sixth round, we'd like to see the Chiefs show us signs that the team is dedicated to featuring him. Kelce can be one of the true game changers of the 2015 fantasy season.